A number of studies have used estimates of historical and projected lifetime net transfers (benefits less taxes) by birth cohort under the Old-Age and Survivors Insurance program to calculate and compare the aggregate present-value sum of such transfers for selected birth-cohort groups. Those calculations indicate that, from a program accounting perspective, the earliest generations of program participants received large transfers from later generations of participants. Some recent studies have referred to this cumulative transfer to the earliest generations as a “legacy debt” and characterized it as a burden borne by the later generations. This article clarifies the legacy debt concept and discusses the conditions required for a legacy debt to exist in a meaningful economic sense. In addition to providing income-maintenance payments to eligible participants, the Supplemental Security Income (SSI) program provides automatic Medicaid enrollment for applicants upon SSI award in most states. Other states require applicants to file a separate Medicaid application. Some use the SSI eligibility criteria for both programs; others use Medicaid eligibility rules that are more restrictive. The authors use matched monthly longitudinal administrative records to test whether automatic enrollment has a positive effect on Medicaid coverage. Using logistic regression with a combination of repeated cross-section and regression discontinuity approaches, they find positive effects of automatic enrollment on Medicaid coverage relative to other policies. The differences are attributable to a discontinuous increase in Medicaid coverage shortly after the final disability determination decision. 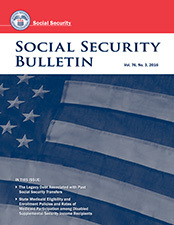 The time lag arising from the often-lengthy disability determination process reduces the effectiveness of automatic enrollment, which depends critically on timeliness of the final award decision.